Caption - The metre gauge Malaysian Railways system (KTM or Keretapi Tanah Melayu) had 66 similar 3-cylinder 4-6-2s with the final batch of 40 being delivered in 1946. This final batch had roller bearings and rotary cam valve gear so were modern engines and lasted until the end of steam in the early 1980s. 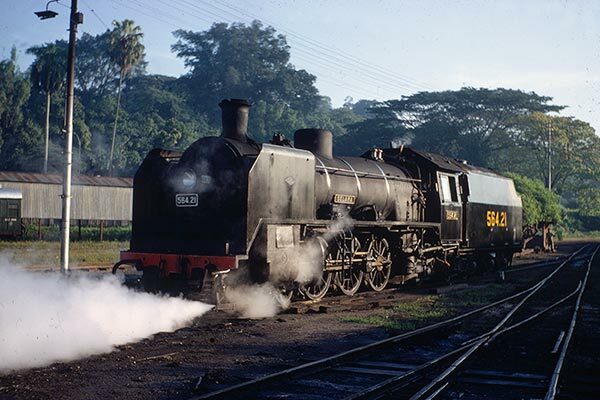 This image shows 564.21 "Selama" (North British 25776/1946) in the morning sunshine at Kuala Lumpur in December 1970 setting off to work a train. This loco was reported as being plinthed at Port Dickson as 564.12.